It was announced that Prof. Shmuel Ahituv of Ben Gurion University in Beersheba would be awarded the Israel Prize in Biblical Research on Independence Day, which falls on 23rd April this year. The Israel prize is the highest civilian honour awarded in Israel and is given on an annual basis. Prof. Ahituv is one of the leading Biblical scholars in Israel and was founder of the Ben Gurion University Press and the last editor of the Biblical Encyclopaedia, who brought that great and definitive work to a successful conclusion. Three members of the Israeli Caving club discovered a cache of silver and bronze coins after crawling for hours through narrow caves in Northern Israel recently. 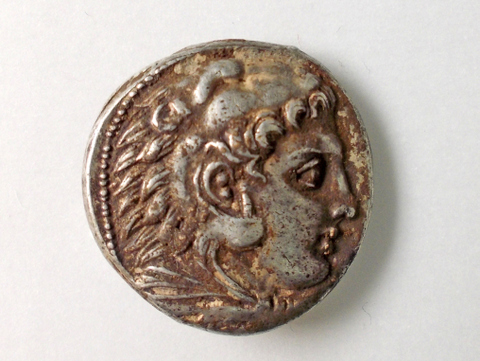 They reported their find to the Israel Antiquities Authority (IAA) who announced that the coins were from the time of Alexander the Great in the late fourth century BCE. Yoli Shwartz of the IAA added that near the coins a cloth bag or satchel was also located which contained silver rings, bracelets and earrings. It was thought that the coins and the jewellery had been hidden by their owners during a period of governmental unrest at the death of Alexander, when conflict developed between his successors, and the owners had been unable to return to retrieve their valuables. The finders were commended by the IAA for their early notification of the treasure and the IAA said that the coins would now be cleaned and examined before being exhibited to the public. The other artifacts would also be examined further to check their dating, which it was believed went back to the Hellenistic period and probably even earlier. The IAA announced that pieces of pottery used in the manufacture of beer by Egyptians were uncovered in a salvage dig in central Tel Aviv, where the construction of office blocks was due to start. The IAA dated the pieces to the Early Bronze Age of five thousand years ago and, according to Diego Barkan, director of the excavation, some of the pottery fragments were of large ceramic basins made in an Egyptian manner to prepare beer. The pieces were made with some organic material for strengthening, which was not a local tradition, and suggested that it was Egyptians that had manufactured it while living in the area. Barkan said, “Until now we were only aware of Egyptian presence in the northern Negev and southern coastal plain…..now we know that they also appreciated what the Tel Aviv region had to offer, and they knew how to enjoy a mug of beer just as the Tel Avivians do today !” Other finds at the site included a bronze dagger and flint tools dating to the Chalcolithic period of c. 4000 BCE.